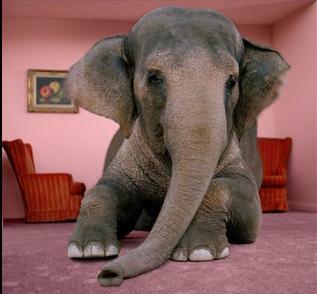 The Elephant in the Living Room? Dr. Michael Siegel of Boston University School of Public Health was interviewed on VP Live Sunday, January 16th. It was a great interview and I have no disagreement with anything the good Dr. had to say. But I am bothered by what was left unsaid. Dr. Siegel is excited about the possibility that e-cigarettes might work well as a traditional “smoking cessation” treatment; that is, temporary nicotine reduction therapy followed by full nicotine abstinence. That’s all well and good for those who can do so, but…. Everyone seems to be ignoring the elephant in the living room: nicotine as self-medication. I smoked for 45 years and every time I quit (and I did so numerous times), I became progressively more ill. The last time I quit nicotine (around 20 years ago), I became confused, forgetful, super-fatigued, and despondent to the point of considering suicide. During the 12 weeks of treatment when I used a nicotine patch, I had progressively more bothersome symptoms as the dosage was reduced. Even on the 21 mg patch, when I stopped smoking, I felt like I had a bad case of the flu, but the full force did not hit until around 2 days after I removed the last 7 mg patch. I was as impaired as any drunk trying to drive an automobile, as my visual memory wasn’t working properly. Try making left-hand turns when you don’t remember what you saw when you glanced right. Most of my mood impairment responded to anti-depressant treatment, but not the cognitive impairments. The cognitive impairments did not abate until I resumed smoking after 6 months of nicotine abstinence. By this time, I was on the verge of losing my job. That experience triggered a couple of decades of research on my part. I learned that nicotine mimics the effects of acetylcholine throughout the body. Thus it can create the paradoxical combination of relieving stress while increasing alertness. It accomplishes the first by relaxing the skeletal muscles. It accomplishes the second by impacting neurotransmitters in the brain. I learned that depression is a common “withdrawal symptom” but that for about 20%, that mood impairment continues well past the time that nicotine would have cleared the system. I learned that nicotine is a potent anti-depressant. I learned that nicotine and nicotinic agonists are being studied as treatments for Alzheimer’s Disease, Parkinson’s Disease, Attention Deficit Disorder, Anxiety Disorder, Mild Cognitive Impairment, Chronic Fatigue Disorder, and other conditions. Think about this. Doesn’t it make sense that people with a shortage of acetylcholine or with an imbalance in neurotransmitters would have some of their symptoms relieved by smoking? Doesn’t it make sense that these people would have the most difficulty giving up nicotine? Why is it considered morally corrupt for people like me to want to function normally and be a productive member of society, simply because we do so by continuing to use nicotine? Yes, there are FDA-approved medications to treat most of the conditions I mentioned. The treatments are not 100% effective. In one study I read, a psychiatrist reported that an in-patient taking several anti-depressant medications came to him and said, “I’ll stop trying to kill myself if you let me smoke.” He reported that he allowed her to do so and was amazed by the sudden improvement in her affect. Many of the recommended treatments have nasty side effects. In fact, the FDA-approved treatments for Attention Deficit Disorder come with black box warnings that they should not be used long-term. Hmmm… short-term treatment for a long-term disability? My mother, who died a few months ago at the age of 88, was extremely impaired both mentally and physically by Lewy Body Disease. Near the end she was constantly hallucinating and could not stand or walk. Is this the future I face? When I learned that nicotine prevents the build up of Lewy Bodies in the brain, I vowed to never stop using nicotine. As far as I know, there is no other known preventive treatment for Lewy Body Disease. I think most of the medical community is in denial about nicotine self-medication. Some believe that all smokers will be healthier if they stop using nicotine. Some acknowledge that there might be some people who seem to benefit from using nicotine, but believe that the percentage has to be miniscule. Therefore, let’s recommend that everyone stop using nicotine. In fact, let’s force them to do so–for their own good. If 20 years ago, 20% of smokers suffered from severe depression when they stopped using nicotine, how many of those do you think quit in the interim? I’d say very few. What do you think the percentage would be today? How about those who are not depressed, but become so forgetful and inattentive when they don’t smoke that they can’t perform their jobs? Why does there appear to be an uptick in the number of people experiencing dementia? My best guess is that at least 30 to 40% of today’s smokers are self-medicating and are not healthier when they stop using nicotine. Let’s say, for the sake of argument, my estimates are way off. Maybe half the self-medicating smokers learned to live with (or were forced to live with) their disabilities. Maybe the people impaired by nicotine abstinence make up only 10% of smokers. That is still millions of people in the U.S. – perhaps billions of people world-wide. I am in hope that researchers and tobacco harm reduction activists will focus some attention on this very important issue. Lives depend on it. I agree with Elaine completely. I think that the psychological effects of nicotine are an important reason why smokers use cigarettes. This is yet another reason why electronic cigarettes are such a great innovation. People can get the nicotine they desire, but without having to breathe in all the thousands of tobacco chemicals and carcinogens. So whether a person’s goal is to eventually wean off nicotine completely or simply to quit smoking and maintain themselves on electronic cigarettes, these are a great innovation that have tremendous potential for public health benefit. I was not trying to suggest in my comments that they should only be used to try to get off nicotine completely. I only mentioned that to counter the notion that once someone uses e-cigs, they will never get off nicotine (even if they so desire). This is the beautiful thing about this product: it can be adapted to the individual needs of the user. Make that two elephants. The other one is the aversion society has toward any addiction, leading to the inability to understand what motivates smokers. My experience with e-cigarette users is that many, if not most, enjoyed smoking, but they knew that smoking was bad for their health. They enjoyed the sensation of smoking, the feel of the cigarette in their hand and the fullness in their lungs. They enjoyed both solitary moments and the social interaction a smoke break could give them. Having all of that, without the health risks associated with smoking, is like a dream come true for them. E-cigarettes are such an acceptable substitute, very many describe themselves as having “accidentally” quit smoking. Now they have no intention or need to ever go back to traditional cigarettes. The claim that these keep people addicts, which will lead to a decrease quit smoking rates, is completely illogical. The only way e-cigarette users will go back to smoking is if you take away their e-cigarettes or regulate them to the point where they are no longer affordable, customizable and/or effective. Contrary to popular belief, addiction is not always detrimental. If a product brings pleasure and a sense of well-being to the user and poses little or no health risks to them or those around them, it should be viewed as a benefit to society. E-cigarettes and other low-risk smokeless alternatives have changed the rules for nicotine use by making it no more of a health risk than caffeine use. The health community needs to acknowledge that and change with the times. These “new nicotine” products stand ready to save millions of lives if our society can get over their preconceived notions about addiction. Vapers, unlike most smokers, will not go quietly into the night while health groups and legislators take away yet another personal choice. There is no justification for it and together we will be stronger than ever. Very nice. I have a couple of questions. Since nicotine is relatively harmless, and I am not saying I disagree, then why attach the easily-politicized term “self-medication”? Why is the same not being done for coffee? Why do we not further get to heart of the issue and state that gambling, drinking, cigarettes, food (tremendously detrimental health effects plus the fact that many dangerous, synthetically-created foods are being approved for human consumption)are all controlled and taxed? Seems to me the real issue here is that somebody is addicted to power, control and taking advantage of most peoples’ ignorance. Great site and listing and your blogs are dead on and we can not be silent any more, but must start voicing our opinions. This is someone’s opinion that has neither knowledge nor insight to how bad cigarettes are for you and can say things like the FDA is on our side. They are in the big tobacco companies pocket and are trying to stop the electronic cigarette, but the only reason they have not made this a banned product is because the public knows better.